eNLokam: 'Chandrayaan' Comes to Thrill !!! 'Chandrayaan' Comes to Thrill !!! ‘Chandrayaan’, replete with amazing and thrilling scenes, is ready for release. This film produced in English by Labour India Educational Research Centre Marangattupilly Kottayam Kerala, the leading educational service provider in India, is perhaps the first Space Fiction feature film made in India. Chandrayaan narrates the astonishing story of the ‘Chandrayaan I’ exploration that hoisted the Indian Tricolour on the moon. The technicalities of launching a rocket and the actual blast off that trembles the theatre will be new experiences to the cinema audience. The replicas of PSLV rocket, Chandrayaan, Spaceship etc were prepared in separate sets for the shooting. A large number of labourers and artists worked for several months to complete them. The script and direction of the film are done by Santhosh George Kulangara, the first Space Tourist selected from India. He is also the director of the visual travelogue ‘Sancharam’ and has travelled to more than 75 countries to prepare the travel serial. He is the Managing Director of Labour India. The film is highly exciting throughout with the launching of rocket, different stages of its trip from the earth to the space, the working of spaceship ‘Chandrayaan’, its entry into the Moon’s orbit, the separation of the Moon Impact Probe (M.I.P) from the Chandrayaan and the anxious moments of its crashlanding on the lunar surface etc. The complexities of science are visualised in such a manner that even laymen can follow them. 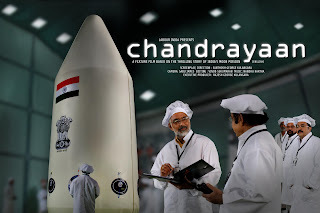 The main persons who worked behind the original Chandrayaan mission have been portrayed in the film. About thousand actors and actresses from India and abroad have acted in this movie. The filming of the movie was done on huge sets of the Rocket Assembling Building in Sriharikotta, Rocket Launching Pad, Mission Control Central Yard, Space Craft Assembling Building, PSLV Rocket, Chandrayaan Spaceship etc. The shooting locations included Delhi, Udaipur, Sriharikotta, Bangalore and several villages in Kerala. Besides, spacious studio floors were also used for filming the various scenes. Highly talented technicians like Sabu James (Camera) Vinod Sukumaran (Editing) Nandu Kartha (Music) etc. have been working behind this cinema. The executive producer of this film, produced under the banner of Labour India, is Rajesh George Kulangara. We all know that India’s Chandrayaan Mission was a grand success. But are you aware of the difficulties and the exciting events behind that mission? The film ‘Chandrayaan’ narrates that story. Let’s wait and see...! SSLC New Text Books Released!